Iron Anywhere™ is the best thing that ever happened for Ironing. Iron Anywhere eliminates the standard ironing board by making ironing clothes much easier and less complicated. You do not need to lug in those heavy ironing boards which take time to set up and are a waste of energy. Iron Anywhere is equipped with heat resistant pads that makes it work smoothly in any place and it does prevent surfaces from burns because it uses quilted thermal materials. 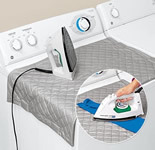 Iron Anywhere has built in features like magnetic corners which keeps the ironing mat firmly in position and attached properly on any surface such as dryers or washing machines. Iron Anywhere can be used on table tops, beds and even on wooden floors because it has built in non � slip grip strips that allows it to remain immovable during the ironing process. This fantastic ironing mat folds easily and it does not need large spaces for safekeeping. You can bring your Iron Anywhere to places whether you are travelling far or just nearby. Iron Anywhere is your perfect travelling mate because it can make you look spick and span anywhere at any time. Use the links below to find the best deal on Iron Anywhere™.